A post-mortem examination has been carried out on the body of US superstar Prince but officials warn it may take weeks for full results to be ready. A spokesperson for the Midwest chief medical examiner in Minnesota said his body would be released to his family later on Friday. Prince died suddenly at his home in the state on Thursday, aged 57. A wave of tributes has swept around the world for the enigmatic musician who sold more than 100m records. In London, US President Barack Obama said he had started the day listening to the Prince songs Purple Rain and Delirious. They had been playing, he told a news conference, at the US ambassador's residence in Regent's Park, Winfield House. "I loved Prince because he put out great music," he said. "It's a remarkable loss." 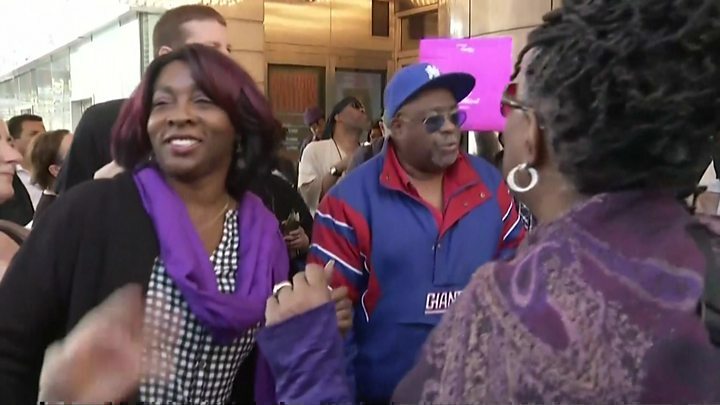 Fans gathered across America to dance and sing along to hits by Prince. Illuminated buildings from Las Vegas to Melbourne, Australia, turned purple - the colour with which he was associated. 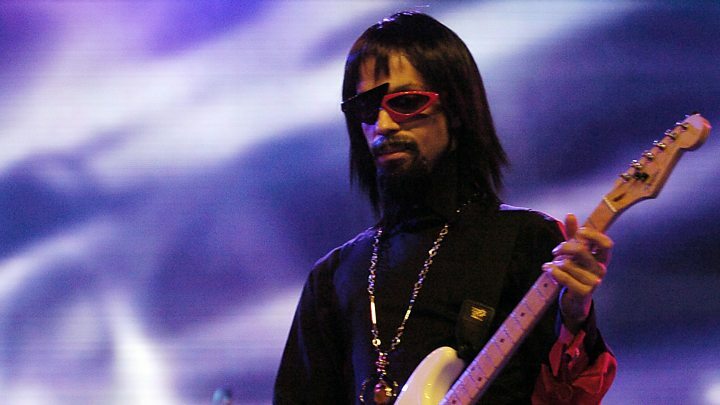 Prince's innovative music spanned rock, funk and jazz. He was at his peak in the 1980s with albums like Dirty Mind, 1999 and Sign O' The Times. What's really in Prince's vault? Police found the legendary artist unresponsive inside a lift at his property, and paramedics were unable to revive him, the sheriff said. The post-mortem examination began at 09:00 local time (15:00 GMT) and had ended by 13:00, the Midwest Medical Examiner's Office said in a statement. The office warned it could be some time before the post-mortem findings were released. "Gathering the results will take several days and the results of a full toxicology scan could likely take weeks," the statement said. The singer had been rushed to hospital in Illinois last Friday, while flying home from a concert in Georgia, but was treated and released a few hours later. Quoting unnamed sources, US entertainment news site TMZ reports that he was treated for an overdose of the painkiller drug Percocet on that occasion. "We're told Prince was taking painkillers for a hip problem," the site says. "We're told he had corrective surgery for his hips around 2010." A transcript of the emergency call to the sheriff's office which reported the death has been released to US media. Phoning at 09:43 local time on Thursday, an unidentified male caller says, "We have someone who is unconscious." Struggling when asked to name the address, the caller replies, "Um, we're at Prince's house." "Yeah, we have um, yeah, we have um, so, yeah, um, the person is dead here," the caller continues. He adds, "And the people are just distraught." An unidentified female caller later joins the conversation to give the number of the house. "You're at Paisley Park, OK, that's in Chanhassen," the police dispatcher checks. "Are you with the person who's..."
The male caller interrupts to confirm, "Yes, it's Prince." Among the many stars to post tributes was U2's Bono. "I never met Mozart, I never met Duke Ellington or Charlie Parker I never met Elvis But I met Prince," he tweeted, with a picture of the lyrics to Prince's song The Cross. Film director Spike Lee, a friend of Prince's, led an improvised party in Brooklyn, New York, calling fans to a celebration. "5,000 Purple Prince Lovers Came Out To Show How We Feel About Da Man," the director wrote on Instagram. "We Shouted, Sang And Danced. It Was All Brooklyn LOVE For PRINCE..."
In Prince's native Minneapolis, the Minnesota Twins baseball team turned their stadium purple, as did the Lowry Avenue Bridge in the centre of the city. On Thursday evening, hundreds of people gathered for an all-night party at the First Avenue nightclub in Minneapolis, where Prince recorded his 1984 hit Purple Rain. One fan outside Prince's home told BBC News: "He was a legend of our city, he was probably the shining star here." Born Prince Rogers Nelson in 1958, he was a prolific writer and performer from a young age - reportedly writing his first song when he was seven. He was also an arranger and multi-instrumentalist, and recorded more than 30 albums. Hits included Let's Go Crazy and When Doves Cry. In 1984, he won an Oscar for the score to Purple Rain, a film in which he also starred. Throughout his career he had a reputation for secrecy and eccentricity, once changing his name to an unpronounceable symbol. He had a mercurial relationship with technology. In 2000, he released singles via the pioneering music-sharing service Napster, but he later declared the internet "completely over" and refused to allow his music on major streaming platforms. Prince's latest album, HITnRUN Phase Two, was released last year and he had been touring as recently as last week. Share your tributes to Prince. Did you meet him? Did you see him live? Email your comments: haveyoursay@bbc.co.uk. Why did Prince change his name to a symbol?